Johnson's Japan Nippon, Kiusiu, Sikok, Yesso and the Kuriles. A very nice first edition example of A. J. Johnson and Ross C. Browning's 1861 map of Japan. Covers the Japanese Islands from Kyushu north to Yesso (Hokkaido). Offers considerable detail with color cording according to province. An inset map in the upper right focuses on Hokkaido or Yesso and the Japanese Kuriles. Another inset in the lower right corner details the Bay of Nagasaki. The disputed body of water between Korea and Japan is here identified as the Japan Sea. 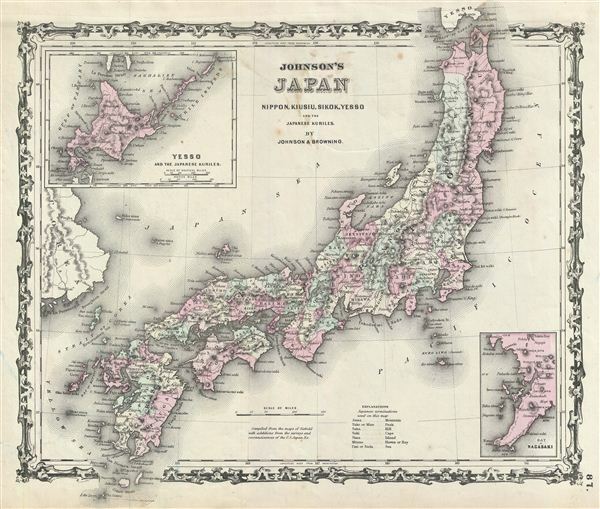 This map does not seem to have been issued in Johnson's 1860, making this the first edition of Johnson's Japan. Cartographically this map is based on J. H. Colton's similar map of 1850. Japan at this time was passing through the declining years of the Tokugawa Shogunate. Japan's centuries of relative isolation had ended seven years earlier with Commodore Perry's historic opening of Japan in 1854. 1860 witnessed Japan's first embassy to the United Stated and with it the ratification of the Treaty of Amity and Commerce, which heralded a rise in western, particularly American, influence on Japanese culture and politics. Features the strapwork style border common to Johnson's atlas work from 1860 to 1863. Published by A. J. Johnson and Browning as plate number 87 in the 1861 edition of Johnson's New Illustrated Family Atlas. This is the last edition of the Johnson Atlas to bear the 'Johnson and Browning' imprint. Subsequent editions reflect Ward's 1862 acquisition Ross C. Browning's shares in the firm. Very good. Blank on verso. Minor discolorations near title.